A typical commercial kitchen ventilation system includes an exhaust hood, metal welded duct work, fan system, and a means of providing adequate make-up air to replace the air that is being removed. The entire system must also constitute a fire-safe assembly within the building and meet pubic safety standards. Exhaust hoods capture heat and contaminates in the air by means of filters, extraction baffles (cartridges), and water wash systems. There are many style variations of hoods with canopies —a large box with and open bottom—being the most common. Type II hoods are used in the collection of steam, vapor, heat, and odors—but not grease. The two sub-classifications of Type II hoods are condensate and heat/fume. Exhaust metal duct work provides the means to transfer contaminated air, cooking heat, and grease vapors from the hood to the fan. Ducts accumulate combustible grease and must be constructed from no less than 16-gage steel or 18-gage stainless steel as per code requirements. The ducts must be securely supported by non-combustible duct bracing and supports designed to carry the gravity and seismic loads as per code requirements, no fasteners should penetrate the duct. 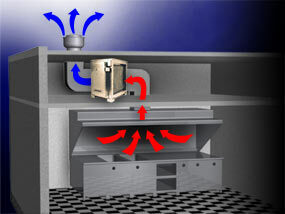 The duct is often run inside a shaft enclosure and that enclosure is typically constructed of gypsum board, plaster, concrete, ceramic tiles, or another approved continuous fire-rated enclosure.